The DM-7050iDX produces a full 7,000mW at 808nm making it one of the most powerful pin point laser epilators you can buy. A convenient thumb switch activates the high-intensity pulses for the rapid destruction of hair follicle tissues. 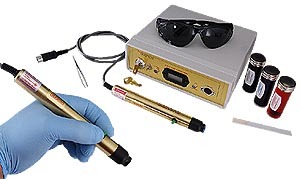 Laser module (130 Jmm2 808nm pinpoint beam), 1 laser power supply, 2 quantity of laser protection eyewear, 50ml carbon dye gel, 50ml of 3% lidocaine pre-treatment gel, 50ml of anti-androgen post treatment gel, tweezers and instructions. This system produces a full 130 Joules per mm2/second making it perfect for hair by hair or detail work. Laser output is delivered by a convenient thumb switch on the comfortable brushed aluminum module. The emission zone treatment area is a highly precise pinpoint beam, which is perfect for hair-by-hair epilation. Laser light with the wavelength of 600 to 900 nm (nanometer) passes through human tissue with very little loss of intensity. 1.5 mm Beam (pinpoint), Power: 130 Jmm2/second max fluence, Laser Type: CW Diode. Treatment Time for Dense Moustache Removal: 15 minutes.